When we see a forward-firing loudspeaker facing us, it seems reasonable to assume that it is radiating its sound output toward us, producing little or no sound to the sides and rear. After all, it's called a forward-firing speaker, correct? And its drivers are all mounted on the front panel of the speaker enclosure, facing the listener. But this simple label overlooks an important aspect of loudspeaker performance that becomes crucial when home theater fans want to place speakers into a secondary enclosure like a big, custom-designed wall unit with special cavities intended to accommodate floorstanding speakers. 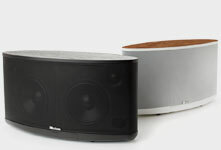 M60 Floorstanding Speakers with front- and rear-facing ports. 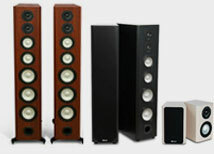 Axiom M60 or M80 tower speakers, for example, have fairly tall, somewhat deep cabinets, tapered towards the rear, with typically one or more rear-facing ports. 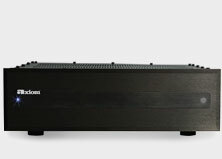 The enclosure volume, multiple ports, and narrow front baffle all contribute to smooth, extended bass response and a spacious soundstage. If you want deep bass, a relatively large enclosure is a fact of life in speaker design. That is a basic law of physics that can't be circumvented. 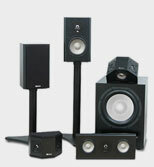 Consequently, larger speakers occupy more space in a person's home. And that gives rise to certain issues. Axiom customers who want to preserve domestic bliss reluctantly yield to spousal or partner requests that no speaker boxes of any sort be visible in the room where the entertainment system resides. Hiding the boxes inside a wall unit seems the perfect compromise. Customers frequently email me, asking if it's OK to go ahead and install a pair of M60ti towers in an entertainment center. Despite my advice not to, one recent Axiom customer did it anyway. He called last week and reported that his M60s sounded so much better when he pulled them out of the wall unit and listened to them out in the room. His wife's approval remained a big, unresolved issue, and we discussed alternatives (dump the wife? Just kidding. . .), including wall-mounting a pair of M60ti's or, as I suggested, suspending them from the ceiling. Large wall units or entertainment centers are sensible solutions to house an A/V receiver, DVD player and other gear as well as the TV display. But putting tower speakers inside the wall unit will degrade and compromise Axiom's neutral and transparent sound. The reason that a well-designed loudspeaker sounds neutral, natural and musical when it's heard in an ideal setup away from room corners, ultimately depends on the speaker's linearity, the technical term for the smoothness of the frequency responses that are radiated directly forward and at increasing angles to each side. The off-axis radiation at angles to each side is important because these are the sounds that are reflected laterally from the walls. Dozens of measurements of a speaker's output into the area of space in front of the speaker (the front hemisphere) show that if the frequency response of the speaker remains smooth and consistent over a broad angle, the speaker will be musically accurate and free of tonal colorations and distortions that lessen the realism of the reproduced instrumental sound. If we listen to instruments facing toward us in a live setting (think of horns, reeds, and woodwinds), the complex wavefront that represents the sound or timbral signature of a particular instrument is composed of fundamental musical tones plus harmonics that are generated by the resonances within the pipe or tube of the instrument. This combination of tones and overtones create the sonic signature for every instrument, and even establishes the unique character to our own voice. This complex mix of tones and overtones is radiated instantly and simultaneously, reaching our ears intact. If the instruments face away from us, they sound different, because the makeup of the instrument's set of fundamentals and overtones has changed. Loudspeakers work the same way. When the designer knows the way the loudspeaker responds over a broad set of angles in a test setting (he has examined a family of curves the speaker's frequency responses into a broad space in front of it), he knows that when the speaker is placed in a room it will continue to disseminate its energy in the same manner, so there is a high degree of probability that the loudspeaker will continue to deliver its wavefronts accurately, and it will be heard that way by listeners in most conventional domestic rooms. In the development of a loudspeaker prototype, great care is taken to investigate and correct any deviations from smoothness or linearity. Even the destructive interference and resulting frequency response glitches caused by edge diffraction from the physical edges of the speaker's front baffle or the speaker grille frame and grille material can be documented and fixed. Knowing this, it's not difficult to understand what happens when you put a tower speaker (or a bookshelf model) inside a wall unit, credenza, or entertainment center. The surfaces in the wall unit's cavity at each side and above and below it, create a set of near-field reflections that don't exist when the speaker operates normally unencumbered by cabinetry. These cancel and reinforce at various frequencies, affecting the linearity of the system and producing all kinds of nasty anomalies and unmusical colorations. Of course, this is a simplified explanation of how a loudspeaker propagates its sound into a room, but the message is clear. For the speaker designer, it is difficult enough to fine-tune the loudspeaker's horizontal and vertical on- and off-axis frequency responses to achieve a linear system that has a reasonable probability of delivering smooth, spacious, and uncolored sound reproduction given the speakers are allowed to operate in relatively free space in a room. Changing that formula by hiding speakers away in enclosures will undo all the efforts of the speaker's designer to create a smooth, accurate, and musical sound reproducer.